Clinton, Michigan - Eden expands its offering of nourishing sea vegetables with an amazingly delicious, endlessly versatile condiment ~ Organic Dulse Flakes. 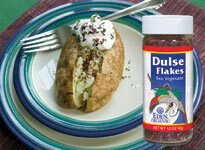 Eden Organic Dulse Flakes are hand harvested and sun dried. They grow wild in the pristine waters of Grand Manan Island, New Brunswick, Canada. This natural resource is managed by a group of biologists and expert dulsers who tend and harvest Organic Crop Improvement Association (OCIA) certified organic sea vegetables in a sustainable, environmentally friendly manner. To ensure that the supply of high quality dulse will continue, harvesting is planned on the basis of detailed surveys and ecological studies of the lush dulse beds. From April to late September, dulsers (experienced dulse harvesters) travel to remote coastal areas of Grand Manan Island in dories. At low tide the dulse is selected and hand harvested from rocks where it attaches itself with its 'holdfast' as it grows. The fresh wet dulse is taken ashore to a cleared area of the beach where flat stones have been laid out to cover the designated area. To prepare the dulse for drying the fronds are cut in half with stainless steel blades. The flat stones are covered with netting that the dulse is placed upon to prevent it from sticking to them. The fronds are dried by sun and wind for one and a half days during which they are turned over once for even drying until they are brittle with a 12 to 15 percent moisture content. The dried dulse is removed from the netting, baled, and taken to a processing facility on the island. Here the bales are spread over stainless steel screens where the dulse is carefully inspected, trimmed, and thoroughly cleaned. The dulse is ground into flakes, repeatedly inspected, and sifted through a series of screens to achieve uniform and varied sizes. The dulse flakes are shipped to Eden Foods' Clinton, Michigan facility where they are weighed into glass jars, capped, and labeled. The caps have two convenient flip up sides, one for shaking and one for pouring. Dulse ( Palmaria palmata ) is a small red sea vegetable that grows in the cold waters of the North Atlantic. It grows rapidly in summer when a fresh 'crop' may be harvested from the same rocks every two weeks. Dulse has been harvested for centuries by coastal inhabitants of North America and Northern Europe who have long relied on this delicious and nutritious gift from the sea as a source of vitamins, minerals, trace elements, and iodine. In Scotland dulse was traditionally used to prepare oatmeal, soups, porridge, and breads, and to season fish. Dulse contains every dietary mineral in at least trace amounts, as well as a range of B vitamins, vitamins A, C, and E, protein, calcium, and potassium. Research has shown that dulse and other sea vegetables may have profound cleansing and balancing effects on the human body. These health benefits are attributed in part to sea vegetables' synergy of nutrients and trace elements and their naturally occurring alginic acid. The easiest way to include valuable sea vegetable health benefits in your diet, Eden Dulse Flakes are fat free and very low sodium. They are excellent sprinkled on cooked whole grains, pasta, hot breakfast porridge, vegetables, and salads. Use them to add flavor to soups, stews, and sauces. They also add zest to salad dressings and are delightful sprinkled on popcorn in place of salt. They come in 1.5 ounce (42g) glass jars, 12 to a case. The suggested retail price is $2.99.